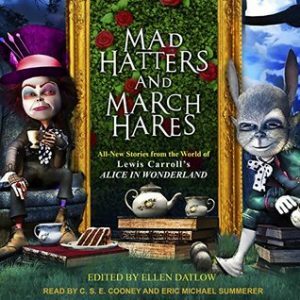 I won a copy of Mad Hatters and March Hares through Goodreads. I think it took me a decade to listen to all of these stories. Like most anthologies, I liked some of them quite a lot and others not so much. Some seemed to just take the excuse of being about wonderland to dash non-sense on a page and call it ‘artistic.’ The narrators did a lovely job though. I thought the male narrator (Summerer) was the better of the two. This entry was posted in books/book review and tagged Alice in wonderland, anthology, audio book, book review, fantasy, short stories on April 13, 2018 by Sadie.